In the latest efforts in a renewed marketing push, Nestlé Nesquik is running programs with the Boys & Girls Clubs in New York City, Miami and Boston and professional sports teams that feature sports events and meet-and-greets with current and former professional sports stars. The programs, which reinforce the importance of kids engaging in fun, physical activities each day, particularly after school, are opportunities for Nesquik to build brand loyalty and market share with Hispanic and general-market kids and families in these markets. This month, Nesquik donated $10,000 to the Boys & Girls Clubs of Miami-Dade to purchase equipment for after-school programs, and hosted a charity basketball tournament to benefit the clubs, plus events with current and former Miami Heat players. 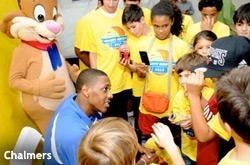 Nesquik treated a group of kids to a VIP weekend with the Heat, including a meet-and-greet on Oct. 18 with NBA champion Mario Chalmers, during which he signed autographs, answered questions and played hoops with the youngsters. The following day, the children shot balls with former Heat star Alonzo Mourning prior to attending a Miami Heat vs. San Antonio Spurs preseason game. The adult charity tournament, with participants from community organizations, took place on court at the AmericanAirlines Arena prior to the Heat/Spurs game. Mourning was on hand to give the volunteer players coaching tips. The Nesquik Bunny tossed out T-shirts during game time-outs, and presented the sports equipment donation check to club representatives during half-time at the Heat/Spurs game. Nesquik also used promotional "Bunny Cam Ears" with the Heat crowd (in lieu of the traditional "kiss cam") during the game, using the jumbo screen. In addition, the brand offered samples outside of the arena, and held a public autograph-signing event with Chalmers on Oct. 18 at a Navarro's Discount Pharmacy in Miami. In September, Nesquik partnered with the New York Mets to host a charity Wiffle Ball tournament to benefit Madison Square Boys & Girls Club. The club held an internal a playoff for young members during July and August. The two top teams of 10 earned a trip to attend the Wiffle Ball tournament on Sept. 15 at Citi Field, and a Mets vs. Marlins game that followed. Former Mets players Edgardo Alfonso and Bud Harrelson served as celebrity coaches for the Wiffle Ball tournament. The brand has not yet announced the specifics of its event plans with the Boys & Girls Clubs of Boston. Nesquik has been working Good Solutions Group for presence marketing for these and other events, including a multi-sensory live "Bubbleverse" experience that was held in San Francisco's SoMa district in June. Separately, in its largest marketing campaign in seven years, Nesquik and Ogilvy & Mather, its agency of record since mid-2012, implemented a national, multichannel effort around declaring Sept. 16 "National Bunny Ears Day." That campaign started in June with in-cinema spots showing the Nesquik Bunny popping up at family, sports and school occasions to give people bunny ears and promote Nesquik. Other lead-up efforts included segments on morning talk shows. The hosts received "Bunny training kits" and were shown how to use a "Bunny-fier" app to insert bunny ears in photos. The hosts displayed their photos during the show, and encouraged viewers to enter a Facebook-based Nesquik bunny ear photo contest (with a prize of a family trip to the Caribbean). A second spot for television featured the Bunny with young actresses Ariana Grande and Jennette McCurdy, now starring in Nickelodeon comedy series "Sam & Cat." The actresses are also featured on a microsite, nick.com/nesquik, where kids can engage in activities such as using the Bunny-fier app to superimpose bunny ears on people or objects in their photos, share those with friends and engage in social conversations. The mobile app can also be downloaded from the Apple iPhone app store. Other tools on the site let kids drag and drop bunny ears into a video featuring the actresses, and create and send "Ear-cards." Another TV spot introduced a new bottle for ready-to-drink Nesquik, on which the Bunny changes color when chilled. Nesquik also recently announced new branded-product licensing deals. Eco-friendly manufacturer Smart Planet will launch a line of Nesquik-branded novelty appliances featuring the Nesquik Bunny, including a Chocolate Fountain and a Cupcake/Brownie Maker. Both appliances are sold with booklets with recipes featuring Nesquik products. Manufacturer Evriholder Products will launch Sip’R Eyes (drinking straws that are worn like eyeglasses), Puzz-L Mug, Mix ‘N Sip, Bunny Sip’R, and Freez’R Pops featuring the Nesquik brand. In 2011, Nestlé spent $26.4 million in U.S. advertising support (not including digital or BtoB) for Nesquik, according to Nielsen. In November 2012, Nestlé USA voluntarily recalled some 200,000 canisters of Nesquik Powder from retailers across the country, after its ingredient supplier recalled some of the calcium carbonate used in the product due to possible Salmonella contamination. There were no reported illnesses from the products, and Nestlé issued refunds to purchasers of the recalled products.